When you think of a speech-language pathologist (SLP), a few buzzwords probably come to mind; terms like articulation, language, or fluency. Most people don’t think of reading when they think of SLPs. However, it is well within our scope of practice to diagnose and treat reading and written language disorders. SLPs have extensive knowledge in language development and understand the foundational building blocks required to become a fluent reader. Additionally, SLPs are efficient in morphology, syntax, phonology, semantics, and pragmatics, which are crucial for fluent reading, reading comprehension, and written expression. Before a child can decode, or read, they must have an understanding that words are composed of smaller units and how these units operate separately and together. This skill is referred to as phonological awareness. Research has shown that children who have strong phonological awareness skills learn to read more quickly (Dickson, D. and Neuman S. (2007). Handbook of early literacy research). Strengthening these skills can help children who are at-risk for reading delays or those struggling with reading be more prepared for the complex and linguistic demands of reading. 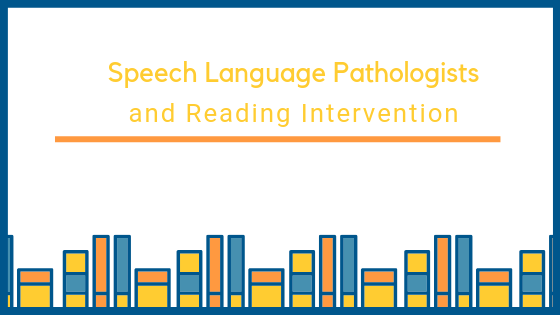 Certain populations with speech and language disorders may be more at risk for reading challenges than others. A diagnosis of any of the following does not cause a reading delay, but it is important to note and be aware of. Some at-risk groups include individuals with Apraxia of Speech, Autism, phonological disorders, auditory processing disorder, and language delays. My Child Has a Hard Time Reading- Now What? An SLP can find the strengths and weaknesses in your child’s phonological awareness and reading skills and develop a plan tailored to your child’s specific needs. In addition to providing dynamic assessments, SLPs can help with prevention of reading and writing disorders by educating teachers and parents on the importance of pre-literacy skills and red flags to look for. Once your child has been assessed and a reading delay has been detected, a treatment plan unique to your child should be developed. At TALK, we use fun, evidence-based multisensory programs to teach reading and spelling through multiple modalities. If you have concerns about your child’s pre-literacy or literacy skills, give us a call or visit our website to schedule an evaluation.